Charming but imperfect, the DC Comics film proves that most contemporary superhero films are wedded to a formula. And that formula has its limitations. Most superheroes are adolescent power fantasies. But as the superhero genre has conquered every available screen and streaming service, the wonder and enthusiasm of these fantasies has sometimes gotten lost — especially in grimdark, angst-ridden DC Comics films like “Man of Steel” and “Batman Vs. Superman.” The new “Shazam!” movie tries to get back to basics. And it's successful — but only partially. Grown-ups, it turns out, just won't leave those kids alone. The new “Shazam!” movie tries to get back to basics. And it's successful — but only partially. Watching Billy try to master his powers with the help of his new foster brother Freddie (Jack Dylan Grazer), is one of the most entertaining parts of the film. Levi does a great job of projecting a 14-year-old's shock, wonder and terror when suddenly granted superstrength, superspeed and the ability to recharge cell phones with a snap. Sequences where he discovers that he can fly and has "immunity to bullets" are predictable, but that doesn't make them less enjoyable, and a bit in which he tries to figure out if he can telepathically talk to goldfish is laugh-out-loud funny. Plus, the de rigeur big screen male superhero snottiness on display in everything from “Iron Man” to “Aquaman” is a lot more tolerable and amusing when the superhero in question is actually supposed to be an adolescent. “Shazam!” understands the appeal of superheroes to children of every age. Kids (and other people too) feel disempowered and unable to control their own lives — like Billy, shuffled from foster home to foster home. But superhero stories give you the rush of imagining that you can right wrongs, stand up to bullies and leap tall buildings in a single bound (or, in Billy's case, in close to a single bound.) The fantasy is straightforward, but that's part of the charm. 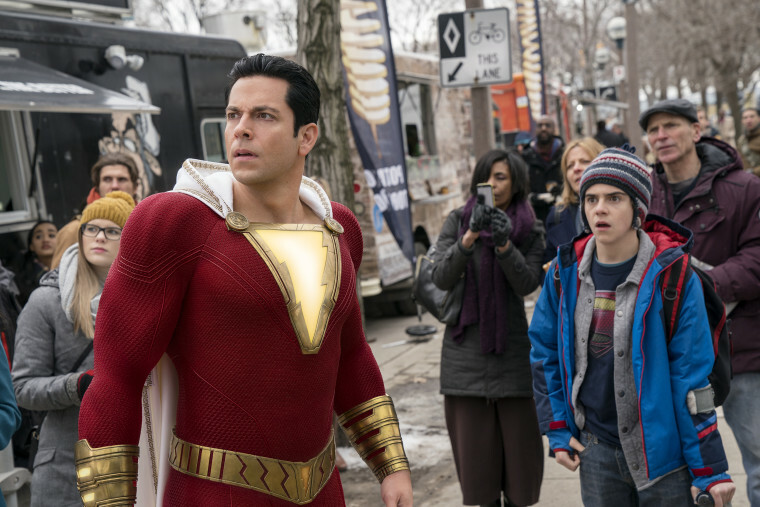 Director David Sandberg and the filmmakers of “Shazam!” understand that charm — at least when they're dealing with the heroes. The villains of the piece, though, cause problems. The bad guy in the movie is Dr. Sivana (Mark Strong). There's nothing interesting about him. He's just another boring world conqueror who rants and sneers like many a superhero villain has ranted and sneered before him. And he can summon CGI demons from another dimension apparently ruled by David Cronenberg. The horror movie aesthetic and violence seem decidedly out of place in an otherwise lighthearted family romp. It is possible to have delightfully over-the-top bad guys without having them literally bite people's heads off. Frank Gorshin's portrayal of the Riddler in the 1960s Batman TV show was a manic marvel of giggles and snorts, punctuated by preposterous overly dramatic pauses. And of course, Batman villains in that series were constantly putting Batman (Adam West) into crazily intricate deadly traps, like a player piano hole puncher. That's much more fun than straightforward murder. 'Spider-Man: Into the Spider-Verse' puts Miles Morales front and center. Will more Marvel diversity follow? For that matter, the original “Shazam!” comics from the 1940s and 50s, by C.C. Beck and Otto Binder, included a range of delightfully goofy villains. Mr. Mind, for example, was a two-inch cartoon worm with super intelligence who created the Monster Society of Evil. (His cameo in the current film is a good deal less lighthearted.) The comic book version of Dr. Sivana devoted himself to preposterous fiendish schemes, like inventing a mechanical glad hand, which made everyone who grasped his palm become peaceful. And then there was Black Adam, a very powerful but not very bright arch enemy. Like Captain Marvel, Adam got his powers from shouting "Shazam!" and he was constantly being tricked into saying it. Then the heroes would nonchalantly punch him out. Today, it's okay for heroes like Shazam or Venom to be stumbling and quirky. It's even okay for a hero to be a cartoon pig, as in “Into the Spiderverse.” But for some reason the villains have to be played straight, which is why “Into the Spiderverse” has its remorseless villains kill off multiple father figures, entirely unnecessarily. “Shazam!,” for its part, presents us with a Dr. Sivana almost entirely stripped of his comic-book goofiness. The villain who used to call Shazam "the Big Red Cheese" now doesn't even get a memorable quip. Even in its most inspired moments — as when it's revealed at the end that everyone gets to be a superhero — “Shazam!” can still feel weirdly disjointed. It's like watching an imaginative kid who has dressed in an oversized suit and spent the day in his dad's office filling out paperwork. If you're telling a whimsical story for kids, why spend 40 minutes on grinding out the backstory before you get to the magic lightning and the red suit? Why all the tedious adulting? The answer is that contemporary superhero films are wedded to an action movie formula designed for adults, by adults. They're committed to a pose of high stakes, where you have to pretend, with a straight face, that the heroes are in danger, and the bad guys are sincerely frightening and evil. Virtually all the recent superhero films follow a similar arc. There's a terrifying villain; the hero doubts they can defeat the villain; the hero self-actualizes and wins. In the segment where the heroes doubt themselves, there's some room for silliness and whimsy. But there's not a lot of room for broader variation. It's a good thing that DC has clawed its way out of its dark and pompous color palette and is now making brighter films that take advantage of a superhero's exuberant potential. But “Shazam!” suggests that there will be limits to the transformation. It's hard for kids to grow up. But it's virtually impossible for adults to turn all the way back into kids again, even when they say, "Shazam!"